Our Danny Boy Collection online store brings you a unique range of high quality Irish merchandise all branded with the officially registered and internationally recognised Danny Boy Trademark. 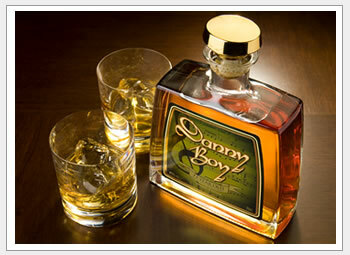 Now Available: Danny Boy 15 Year Old Irish Malt Whiskey! Just like the famous and much loved melody, Danny Boy 15 Year Old Irish Malt Whiskey consists of a rare whiskey carefully selected from stock set aside for its outstanding character. This magnificent Irish Malt Whiskey is a minimum of 15 years old and is matured in the finest American White oak casks, adding a fresh sweet flavour to the whiskey. Steeped in history and local legend it has a silky smooth, yet rugged rich character evocative of the Irish landscape and its people. 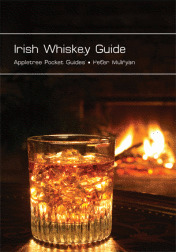 Irish Whiskey Guide is a brief look at the story of whiskey and its place in Irish history, all the way from monks to poteen to single malts and today’s popular special blends. 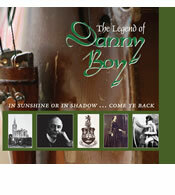 This unique ‘talking book’ and song CD brings to life the fascinating history behind the famous Danny Boy name. Hand crafted and painted in Ireland, this limited edition figurine of Blind Jimmy McCurry, one of the characters in the Danny Boy Legend, makes an ideal gift for home or office. 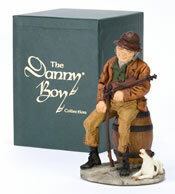 The official Danny Boy logo is engraved into the base of each figurine. Each figurine measures 18cm high. Tracing Your Irish Roots looks at an increasingly popular pastime.